The rapid adoption of business VoIP phone systems has been necessitated by many factors, with lower telephony costs being at the forefront. VoIP offers many other benefits over traditional telephone systems including flexibility, scalability, and advanced functionality. Below is a brief look at the pros and cons of VoIP systems. 1. Lower Cost: Affordability is perhaps the leading advantage that VoIP phone systems have over traditional business telephone systems. VoIP costs are significantly lower in as far as both the initial investment and monthly recurrent charges are concerned. 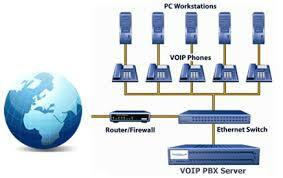 Some simple VoIP phone systems consist of software which enable businesses to make free PC to PC calls. 2. Scalability: VoIP systems are very scalable and can be tailored to fit your individual requirements and/or budget. VoIP phone systems come in many forms; some only limit you to making calls to other VoIP-based telephone systems, while other VoIP phone systems can make calls to any kind of phone system. 3. Flexibility: VoIP systems enable businesses with employees in remote locations to communicate seamlessly, and at lower costs. VoIP allows you to add “unlimited” telephones and/or telephone numbers – only limited by the bandwidth capacity. In case you need to add more telephones/numbers, just add extra bandwidth capacity to your system. Latency: VoIP business telephone systems sometimes suffer from latency issues resulting from delays in reassembling data packets. VoIP systems work by converting voice into digital data, and placing the data into packets for transmission over the Internet. When the packets arrive at the recipient’s end, they may not necessarily be in the correct order and thus may require some time for the VoIP system to reassemble. Various solutions such as compression algorithms have been implemented to help deal with latency issues, especially when insufficient bandwidth is the cause. Trust a local expert to help you choose and install the best VoIP system for your needs. Contact Affordable Telephone Systems today! Reliability and Functionality! . . . Our Commitment Guaranteed!! What is VoIP and would it work well for my business? Offering systems for over 35 years, we specialize in telecommunication systems, service and repairs, cabling-voice data, and more. We provide a phone system that you can trust, at a price you can afford. We offer on-site service to all customers all of the time. We realize that the race for quality has no finish line, and we're dedicated to taking care of our customers.